Tuesday morning I awoke to the aggravating sound of sleet pelting the bedroom windows. I much prefer the soft whisper of snowflakes to the sideways assault of frozen water, for a whole host of reasons. One is that whispers are easier to sleep through. Snow days (or sleet-and-freezing-rain days) are the only chance my brood gets to sleep in during the winter. 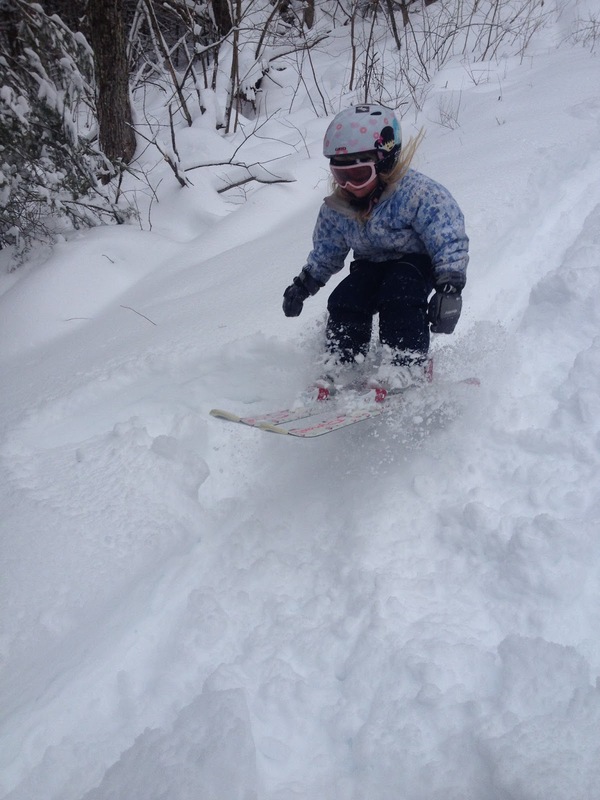 Otherwise, we are up early for school, and just as early – sometimes earlier – for weekend skiing. It was nice Tuesday not to have to drag the kids out of bed in the dark of a winter morning. It’s been a while since we’ve had a snow day. When the kids were younger, we used to build little kickers in the back yard on the rare weather-induced day off. The kids would fly off the jumps on sleds or skis and come back inside with rosy cheeks and wet mittens. Or we’d make snow creatures in the front yard. Some winters we’ve had such a huge pile of snow at the edge of the driveway, the kids could build snow forts complete with sitting areas and tunnels and exit slides. We haven’t had a snowbank worthy of a fort for a couple of winters now. In December the snow-building opportunities seemed to be looking up. The plow had made decent piles in the fort area. Elsewhere in the yard, the kids had shaped and piled blocks of snow to make the start of an igloo. There was even a small snowman – until the puppy ate it. Alas, all that white stuff has long since melted. Tuesday’s warm temps and so-called “mixed precipitation” resulted mainly in our driveway-turned-skating-rink melting out – again – into large puddles of slush. There was not enough snow to make even one snowball, let alone an elaborate structure. Instead, we went for a long walk in the woods, discovering ice-fringed hemlock and beech branches before the temperature warmed to a melting degree. In the shelter of the trees, the mixed precip had left enough white to make a satisfying crunch underfoot, although we had to step carefully through the not-quite-frozen marshy area along our route. Despite the sad, snowless state of the yard, the sleet day timing was perfect. The day before, two of these children had pulled in quite the haul of birthday presents, which they now had time to properly explore. One kid was recovering from a cold, and we both appreciated the bonus relaxation time to push her back toward healthy. The day also left us with time for catch-up chores. In the process of cleaning up, lost mittens were found buried under the birthday goodies, new clothes given as Christmas presents were unearthed in the corner of a bedroom, and long-forgotten toys were happily rediscovered. There were also a few rounds of board games played, some quiet coloring time, bouts of spontaneous snuggling, and – of course – the arguments that come from too much together time. By the end of the day, the puppy and I were both exhausted, even if the kids seemed rejuvenated by this bonus day off. I thought of my friend in Tahoe, where they’ve received something like 300 inches (that’s 25 feet!) of snow this month. Her kids have had 10 snow days in the last few weeks. That means they’ve been out of school almost twice as many days as they’ve been in. While the occasional snow day is a nice pause in routine, I’m not sure I’d take 10 of them in a month. But I sure would like some of that snow. Original content by Meghan McCarthy McPhaul, posted to her Blog: Writings From a Full Life. This essay also appears as Meghan's Close to Home column in the January 27, 2016 edition of the Littleton Record. Last week I was interviewing a guy for a story I’m writing and realized we were neighbors once, nearly two decades ago and more than 2,000 miles from here. The first hint was when he said he’s lived in Crested Butte, Colorado, for the better part of the last 40 years. But it was his mention of having golden retrievers – a long line of them, now in the 12th generation – that ultimately tipped me off. It’s safe to say I’m a dog person, the kind who crouches down to greet canines at just about every opportunity – at holiday parades, during walks through the neighborhood, along hiking trails. I will often ask strangers the name, age, and breed of their dog without seeking a bit of intel about themselves. Dogs make good conversation starters – and great company. I knew three of my interviewee’s dogs, from the seventh and eighth generations of the ongoing line, back in my ski town days, when I was living in a basement-level apartment across the street. Chipeta, Moki, and Dillon – a mother and two siblings – would often amble across the traffic-less road and sit at the top of my front steps, dropping a tennis ball down the stairs until I either came out to play or let them in to hang out. They were mellow and sweet and – most importantly – provided a doggy fix to a dog-loving girl who was without a dog. After I made the connection last week, I pulled out an old photo album to look for pictures of the golden trio. Stuck amid images of a 20-years-younger me, I found a few shots of the neighborhood dogs – including one of the three of them lined up at the top of my stairs, an old tennis ball at their feet – along with other pups who filled the void during my dogless years, that time between when I left my childhood home and the dogs I grew up with and when I got my own first dog. Otis and Boone – a golden retriever and a black lab/golden mix – accompanied me on countless hikes and backpacking outings. They belonged to friends, and I sometimes dog-sat for them when their people were away. Ike, an age-hobbled, perpetually smiling yellow lab, was another of my dog-sitting charges. Chelsea was the next-door-neighbors’ mutt, who ran alongside her people on long mountain bike rides well into her old age. The ski shop where I worked in Crested Butte had a host of shop dogs. Bella was a slightly gawky Bernese Mountain dog who belonged to one of the shop owners. Ruby, a yellow lab who went with the other owner, was Bella’s older, more distinguished counterpart. Rounding out the mix was Honey, a sweet golden who tagged along to work with the office manager. Around the corner from the house where I lived for four years, there was a huge malamute named Ullr, after the Norse god of winter. Ullr howled daily with the noontime whistle and was always up for a belly rub. I was happy to oblige as I passed the inn where Ullr kept watch, finding contentment in his general doggy happiness and the feel of fur on fingers. Then there was Ben, a smiling, slightly shaggy, black dog who lived with the family I worked for when I left Colorado and overshot New England by a few thousand miles to land, briefly, in the west of Ireland. Ben loved to play soccer and would join me and the family’s two boys in our evening games in the barnyard. That combination of a dog to pat and a soccer ball at my feet lent a sense of the familiar in a place far from home. I haven’t thought about this cast of dogs for a long while, but that random blast from the past brought them all back to me. 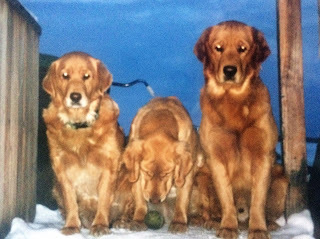 Like good dogs everywhere, this canine crew offered unconditional friendship at times when I was without my own doggy sidekick, easy company during skiing and hiking explorations, and simple stress relief through belly rubs and ear scratches. It’s been more than 15 years since I moved back East, which means all those dogs are now long gone. But I still can picture them in the old, familiar places, can still see in my mind’s eye their dog-smiling faces and happy anticipation about everything from hikes to biscuits to the noontime whistle. They weren’t my dogs, but they’re all locked into my heart’s memory just the same, friends from other times and other places. Original content by Meghan McCarthy McPhaul, posted to her Blog: Writings From a Full Life. This essay also appears as Meghan's Close to Home column in the January 13, 2016 edition of the Littleton Record.